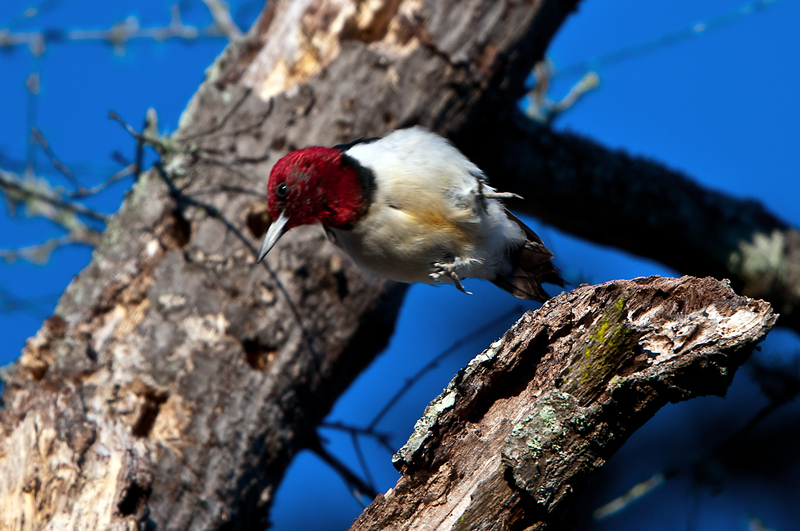 While in Gainesville, Florida, in December, I photographed Red-headed Woodpeckers at Prairie Creek Preserve. Prairie Creek Preserve is one of the properties owned by Alachua Conservation Trust (ACT). ACT is a nonprofit organization that works to preserve land in Alachua County, and since it started in 1988, it has facilitated the protection of over 14,000 acres of land and conservation easements. We are fortunate that there are organizations like ACT that work to protect and preserve our natural resources and the wildlife that inhabit it. 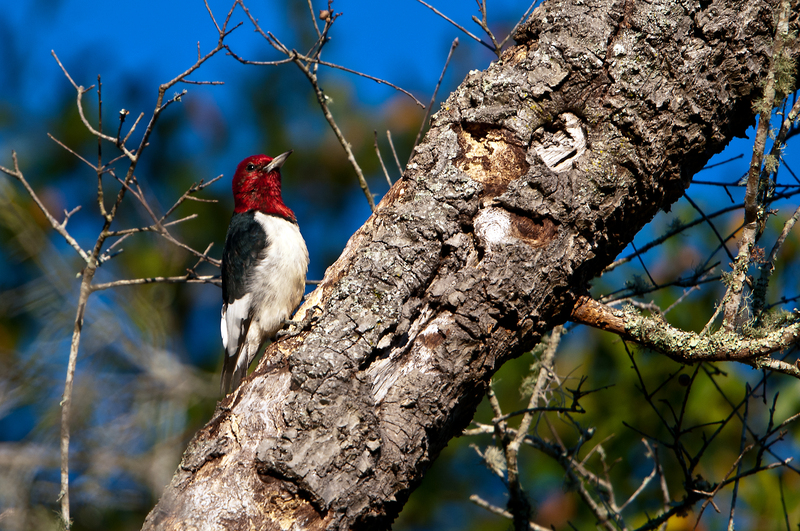 Six months ago, when I was at the preserve, I saw a couple of Red-headed Woodpeckers, but was not prepared to properly photograph them, but this time was different. 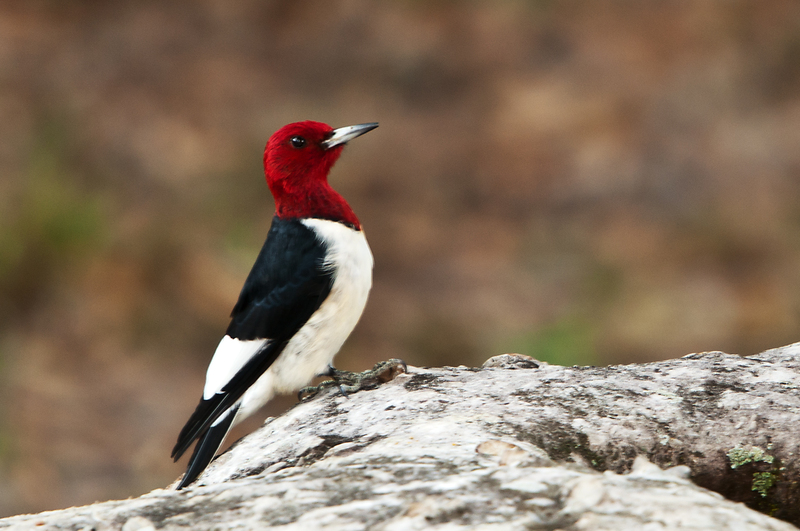 I spent much of a late afternoon at one location watching several Red-headed Woodpeckers, and the conditions for photographing them were perfect. They were putting on quite a show for me and did not seem to be bothered that I was nearby photographing them. 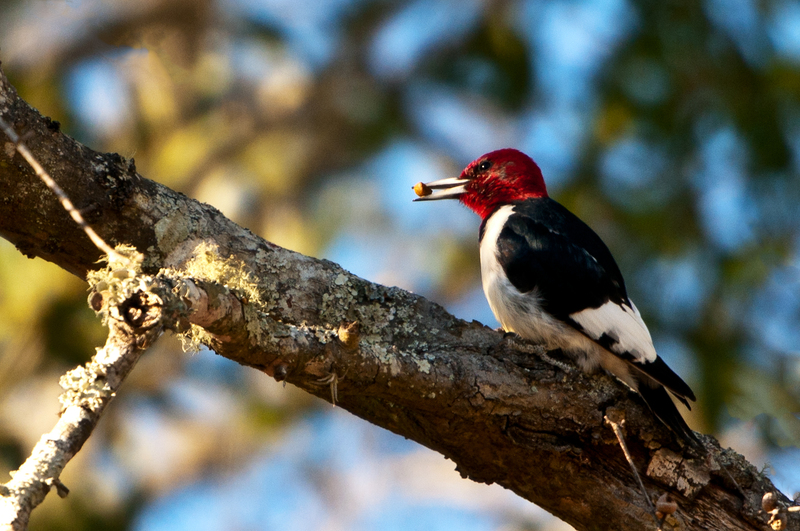 Adult Red-headed Woodpeckers are strikingly tri-colored, with a black back and tail and a red head and neck, and their underparts are mainly white. Adult males and females are undistinguishable. They fly to catch insects in the air or on the ground, forage on trees, and store nuts and acorns. While I was photographing the woodpeckers, the ACT Land Manager explained how they gather acorns in the fall and store them in trees by making holes in the trees or use existing crevices. After placing the acorns into the holes, they cover them up to prevent other birds from finding them. During the winter, the woodpeckers uncover the acorns to feed on them, and that behavior was exactly what I was witnessing and photographing. Above is a woodpecker with an acorn it had just removed from the tree, and below are more photographs of other woodpeckers with acorns. The below image is special because the woodpecker was looking straight at me and into the lens with an acorn in its bill. Opportunities to capture such an image are once in a lifetime–at least mine. I was able to capture another unique image when one of the woodpeckers leaped from the tree and flew away. 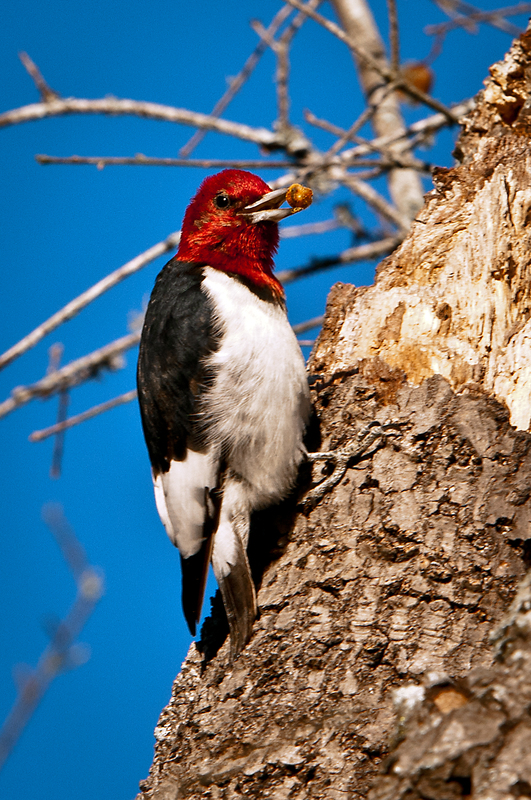 The image (below) is after the woodpecker left the tree, but before the it opened its winds to fly. 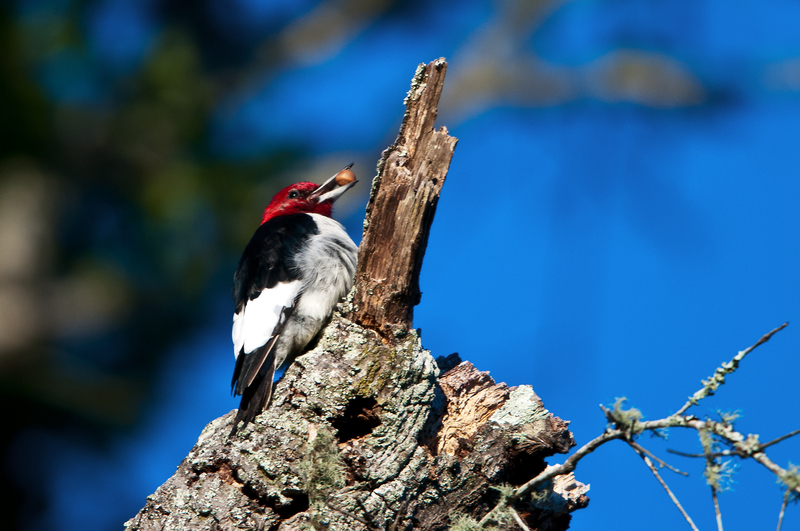 In my opinion, any day that I see one woodpecker is a good day, but that day was a very special day. 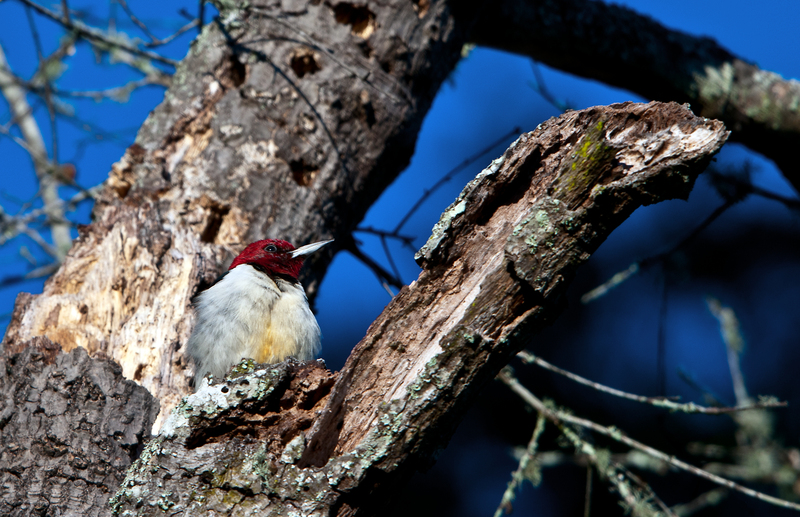 Not only did I see many Red-headed Woodpeckers, but I was able to photograph them, too. Double click on the images to see them in more detail. 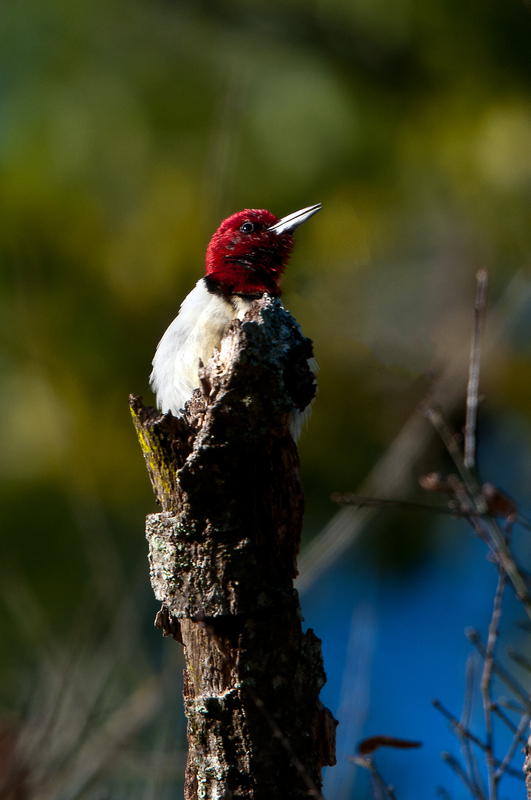 This entry was posted in Bird Photographs, Nature, Wildlife and tagged red headed woodpeckers, Red-headed Woodpecker, woodpeckers. Bookmark the permalink. A corn in the beak is worth two in the bush. The birds have been outclassed by the detailed background of the trees. 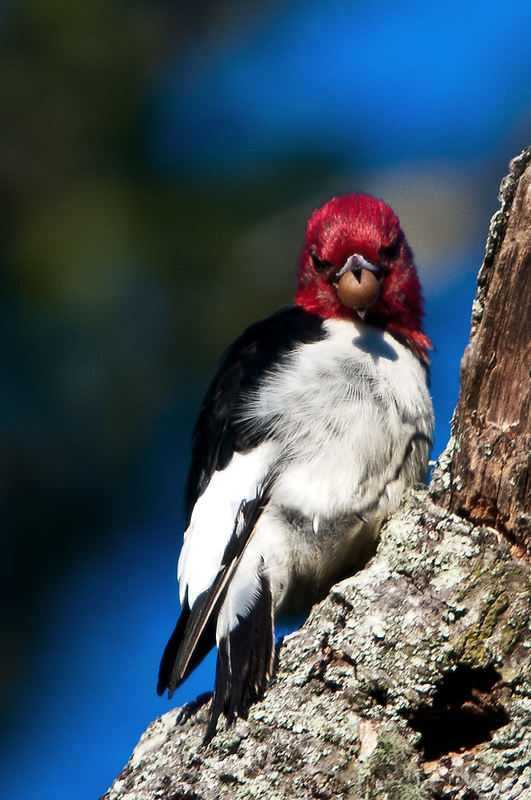 Despite this intrusion the red head woodpecker is still the star and is beautifully captured by the photographer. What amazing photos! I love the one where the bird has not opened his wings yet … he looks like he’s leaping someplace rather than flying … a “wonder bird!” But my favorite is the one of the bird staring right into your lens with the acorn in his beak!!! What an expression on him/her! Magnificent!!! Outstanding images, each and every one of them! Excellent photography and interesting bit of information on behavior. Details, especially in the closer shots, are amazing! Thank you for taking the time to read and view my blog and also for your very positive feedback on my photos.